Dr. Juan B. Martinez, M.D. Doctor Juan Martinez, who speaks perfect English and Spanish, is our children's new Pediatrician. He has done more for our son Sean in 10 days, than all of the other pediatricians and specialists have done for our child in 3 years. Who is the best pediatrician: Dr Juan B. Martinez. Dr. Juan B. Martinez, M.D. was dialed by accident on a Sunday. 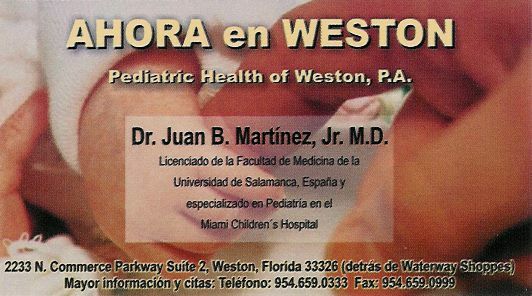 I was calling Pediatric Associates of Weston, where I had taken my children for the past 3 years. They overlooked the fact that my oldest son was not able to hear properly, and they could have prevented this with proper treatment. I would never go back to these people again. It all began with our son Sean. By the time Sean was 2-1/2, we were extremely concerned, because his speech and communications skills were decreasing. We sought professionals, and soon found out during testing that his hearing was seriously impaired. He also was diagnosed as being 65% delayed. I felt that his inability to hear played a key role. From his symptoms, I worried about Sean having PDD; specifically a mild form of the Spectrum of Autism. But with this Diagnosis of severely compromised hearing, I hoped restoring his hearing would reverse his symptoms. In 2-1/2 years, Pediatric Associates failed to recognize that Sean was regressing, and could not hear properly. I feel that Pediatric Associates should have put more emphasis on our son's health and development. Our next step was an E.N.T., who wanted us to hold a kicking and screaming 2-1/2 year old child in a revolving barber chair that he used for examining patients. Sean screamed and kicked as the doctor attempted to dig wax out of one of his ears with some kind of wand. He gave up in frustration, as a screaming Sean wiggled and screamed even louder - screams that could clearly be heard outside in the waiting room by a friend of ours who came with us. This was followed by another E.N.T., who again attempted to remove the heavy wax deposits from Sean's ears. Again Sean screamed and cried, but even a few days later, we did not observe any noticeable results. Totally by accident, I misdialed Dr. Martinez' telephone number on a Sunday, and spoke with the doctor in a matter of minutes! The call was because of our 1 yr old, when I became concerned about his inability to keep solids down. Although I wasn't even his patient, he told me what to do, and spent more time on the phone with me than my own pediatricians spent with me during office visits. On our first visit, Dr. Martinez spent an unheard of 2-1/2 hours examining and treating our two children, the majority of the time being devoted to Sean. This exceeded the total time our 3 year old has spent with all doctors during all visits in his first three years of life! He told us to use mineral oil, and to come back in 10 days. On our second visit, Dr. Martinez spent an hour and twenty minutes with us, and flushed Sean's ear canals. Sean left his office, and walked outside to the parking lot. The faint sound of a car horn could be heard in the distance. To us this was a normal sound, but to our surprise, Sean actually turned his head, and was able to hear so well that he actually was able to distinguished which direction the faint sound was coming from. This website is our way of saying thanks to Dr. Juan Martinez. 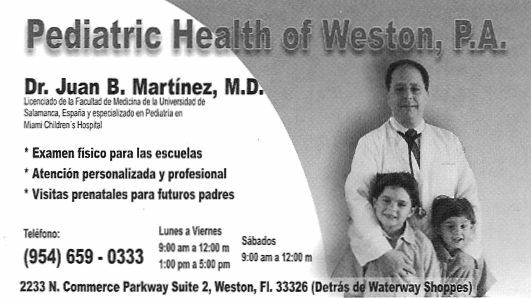 Dr. Juan B. Martinez, M.D., of Weston, Florida, whose broad specter of knowledge far exceeds what is required, is now our Pediatrician. This is the only doctor that I know of who spends as much time as necessary on his patients. For the first time, my son was not just a number, he was a person with a name. The two adjoining waiting rooms are kept immaculately clean, with carpeted floors, television, and plenty of toys for our children to play with. This website was NOT put up by Doctor Martinez, his Office, Pediatric Health of Weston, or anyone even remotely related to him. In fact, I just asked him if he would mind if I showed his card to other people. As of March 18, Dr. Martinez doesn't know that he made such an impression on the parents of Sean, our 3 year old son, that we put up this website about him and how he treated our family.